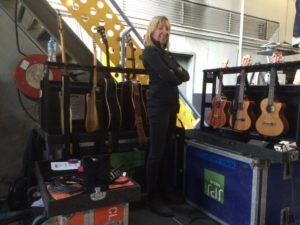 SoundGirls Members who are actively pursuing a career in Guitar teching, Backline or Concert Production are invited to shadow Guitar tech, Claire Murphy. Claire is currently on tour with Vance Joy. The experience will focus on Guitar teching; setting up “guitar world,” setting up the stage, experiencing line check and soundcheck with the artist. This is open to SoundGirls members ages 18 and over. There is one (1) spot available for each show. Most call times will be at 11.30am (TBD), and members will most likely be invited to stay for the show (TBD). Ideally, applicants will be able to demonstrate some experience in touring or knowledge there of, to gain the most from this opportunity. Please fill out this application and send a resume to soundgirls@soundgirls.org with Vance Joy in the subject line. If you are selected to attend, information will be emailed to you.